The Nintendo Switch has been a big success in its first few months on sale. Our initial review Nintendo Switch Review: Play Zelda on the Toilet Nintendo Switch Review: Play Zelda on the Toilet Nintendo's back, reinventing themselves after the dismal performance of the Wii U. The Switch is a combination of home console performance in a portable package – the best bits of the Wii and DS brands. Read More had some reservations about the system, but thanks to a steady stream of awesome games 7 New Nintendo Switch Games You'll Want to Play in 2017 7 New Nintendo Switch Games You'll Want to Play in 2017 The Nintendo Switch is off to a great start, and 2017 holds many more great games. From Mario to Sonic to Minecraft, here are the games coming to the system before the year ends. Read More the system is becoming an even more appealing package for gamers. But there’s a recent annoyance present with the Switch: a battery life display bug. This can cause the on-screen display of the battery life to drop from 100 to 0 percent in minutes, or show that the battery isn’t charging even when the system is on the dock. If you’re having an issue with this, here’s what you should do. First, make sure your Switch system is up to date. Connect to the internet, then go to System Settings > System > System Update. Apply any update it finds; you should be on version 3.0.1 or higher. This update should fix the battery problem. Turn Auto-Sleep off by visiting System Settings > Sleep Mode and set both Auto-Sleep (Playing on Console Screen) and (Connected to TV) to Never. Connect the Switch’s official charger directly to the system (without using the dock). Wait for the battery to fully charge — or give it about three hours if the display doesn’t hit 100%. After it’s fully charged, let the system sit for an hour while still connected to the charger. Following this, unplug the charger and let the console sit on the home screen for several hours until the battery is almost completely depleted. When the system is close to empty on battery power, press and hold the Power button on the top and hit Power Options > Turn Off. Let your Switch sit for at least a half hour. After repeating this process several times, the indicator should improve. Obviously this isn’t a fun solution. Other have reported that the problem fixes itself if you restart your system a few times, so that may be a better solution for you. Thinking about buying a Switch? Check out answers to some of your biggest questions 15 Questions You Have About Nintendo Switch Answered 15 Questions You Have About Nintendo Switch Answered The Nintendo Switch is here! We've got one, and have answers to the top questions about the system. Read More about the system. 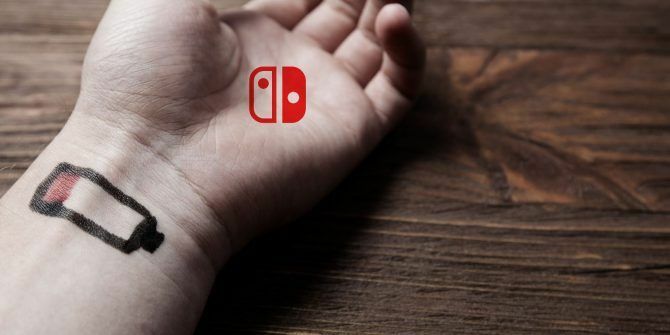 Has your Switch been affected by this bug? Let us know if the update or this process solved the problem for you!